Like most healthy couples, Hubs and I have had discussions about what happens if one of us gets sick. Not so much the day to day. More about our philosophies on life…and death. Of course we have our wills up to date, our financial affairs in order as much as possible, insurance policies to cover the unexpected. We’re both still relatively young, but the actuarial tables are starting to edge out of our favor. Hubs is an extremely active guy. He walks the dog three times a day, usually logging over six miles a day (according to his activity tracker). It’s an important time for him. It allows him to become more centered. He craves it. His body and his mind get crowded and busy if he’s not able to do it. I like a good walk too. Or a long bike ride. But I don’t “need” it like he does. I’m perfectly happy to sit in my favorite arm chair for the better part of a day with nothing but a bottomless cup of tea and a good book. In part, these proclivities drive our feelings about illness and death. After it’s done, Hubs and I agree that a small ceremony with our nearest and dearest would be all that’s required. Hubs wants his favorite song “Somewhere Over the Rainbow” sung by Israel Kamakawiwoʻole. I want either “Lucky” or “The Rainbow Connection” – both sung by Jason Mraz. We don’t want a mourning of our deaths so much as a celebration of our lives. We also agree that cremation is the most environmentally friendly solution. Neither of us like the idea of our corporal being rotting in the ground. In most circumstances, we do not get to choose our time. However, in case of debilitating injury or illness, both my husband and I believe that we should be able to choose if we want to. We both have medical attorney for each other. We’ve had some pretty intense discussions about the mechanics of “when” we felt that our own end should be hastened. For Hubs, that time would be after catastrophic injury. If he’s unable to move and get around – if his body is failing and will only continue to fail, he will give me a “when”. I will respect his wishes, if only because I love him. I understand that even though I don’t think he could ever burden me – his soul would suffer if he weren’t able to tend to his own physical needs. I hope to never be in that situation – but I accept his rationale and would support him. Following my accident, I have a different view. I had to have help with a lot of my physical needs during my recovery. For a while, I couldn’t shower on my own. I couldn’t sit in the front seat of the car. I couldn’t put on my own clothes. It was difficult to accept help. I think we’re raised to do things for ourselves. I see it in my toddler as I encourage his independence. I did need help though. I accepted it, for the most part gratefully. Perhaps only because it was a short-term situation. It’s possible I would have different feelings if it were more long-term. But I feel like I could accept physical help if I had issues with movement and self care – as long as my brain were still functioning properly. I don’t want to be a burden to anyone – if I need daily assistance, Hubs has my full support to put me in a place where they can take care of me (as long as he visits regularly and brings me books). But if my brain is still functioning, I *think* I would like to still be here. Included in the physical injuries I sustained in the accident, I suffered a minor brain injury. My brain, although now functioning reasonably well, took time to recover – and I will never return to my pre-accident function. I find now that I still grapple to bring words to my tongue, especially when I’m tired. I don’t plan effectively. Sometimes I can’t figure out how to get from Point A t Point B without my GPS. I forget appointments and fine details. Not so much as in the early stages of my recovery – but enough that I’ve had a glimpse of what a more severe brain impairment could do to me. And I didn’t like it at all. It’s part of the reason I haven’t been able to bring myself to watch the movie Still Alice with Julianne Moore. The trailer alone is enough to make my heart quicken and bring tears to my eyes. I can’t imagine slowly losing myself. Forgetting things. As a writer, the idea of struggling to find the words to communicate is terrifying. I’ve told my husband that while I think I could handle a physical impairment – even quadriplegia, but the idea of losing my mental being, losing myself – that’s my line. I think that loving someone completely means having discussions to gain an acceptance of these limits. My husband has told me where his line is – and if I ever see him getting close to it, I’m sure that we’ll have more discussions. It’s possible that the line would change at that point – and that’s his prerogative. I know, without question, if I had to have the discussion about my future with my husband, he would support me. He would make certain that I understood the consequence, as I would with him, and I would support him in whatever way I could. But we love each other enough to have those frank discussions, so that if either of us had to make a decision, we could do it compassionately – without feeling any regrets. We’ve been very lucky to have been gifted the time that we’ve had together. Every day after that is gravy. Do you have a “line”? Have you discussed it with your family? Will they honor your wishes? 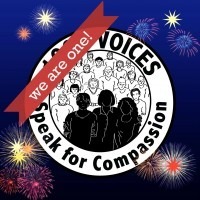 (Today marks the one year anniversary of #1000Speak – click here to read more). My family has always been very open about end of life issues/planning. I feel so fortunate to have this openness as for so many it is a forbidden topic. I’m glad you wrote about it and I hope it spurs discussion for those who read it and may need to broach these tough issues. I am a nurse and have seen too many families struggle during a crisis with decisions, that could have been easier with advanced planning. Great topic that needs more exposure. It doesn’t make sense to wait until a crisis to me. Why not have those conversations up front – for something that happens to us all eventually. This is a common topic, in the news, in Canada but then it came closer to home than that just a few months ago. My brother suffered his accident. We were suddenly forced to think of brain injury and worse. Thankfully we didn’t have to deal with a lot of those horrible possibilities, but nowhere is compassion more necessary than in families, when the worst occurs. Very true. I’m glad that it worked out for you. I have to agree with you. After living with Alzheimer’s Disease for the last few years I have said that I wouldn’t want to go on. It’s a rough disease and I’ve seen enough of it to know I don’t want to do it. What a wonderful post, thank you for sharing your experiences. I too found it difficult to accept help after having two C-sections. It’s a slow process, but I’m learning to allow myself to be vulnerable with love and compassion, especially with my husband. It is hard to suddenly be dependent on others for personal care. It takes time to accept on both sides. I think it’s more about opening that line of communication. To know that there is a line even if you don’t know necessarily where it is. This is an important conversation and one that my husband and I have had too. For me too, the fear is of losing my mental capabilities more than the physical. Yes! I think because I’ve seen both sides in a limited way, I can see the distinction. Glad you are having those conversations too – they’re so important. You’re really smart and healthy to be able to talk about it!!!! It’s something everyone really should, even if we don’t want to, its life, and life is full of living, and death too….. It is! Everyone has to die someday. Better to come to an early acceptance of it so you don’t spend your life worrying about it. This is thought provoking. It is important to talk about it..but you never really know in the moment. When my father was diagnosed with terminal cancer he met with the hemlock society and made a plan. He was sure that he would know when the time came and wanted to be able to exercise a choice. However the time never came. Perhaps even the shred of life he had in his hospital bed in our living room was enough. Or perhaps he slipped into a place that was “other” enough that he felt he had already left. I love that you talk about it, and your accident has given you more information than most. Thank you for this. Agreed – in the moment it may be a different choice. But I think it’s key to have those discussions so no one is taken by surprise if it does ultimately come to that. (And I’m so very sorry for your loss). We just went through a similar discussion after the recent passing of my grandmother. The idea of my husband or I not being here causes me so much anxiety but as you said, it’s better to have a plan, and that does help out my mind at ease. It is scary to think about the unknown. But yes – planning can help ease the worry. Very interesting. I’m very afraid of death to the point of panic attacks & I can’t really consider it. I agree with you though – definitely physical impairment I would not see as a reason not to want to live, though I can understand why some people do. Funny…someone wrote a conversation they’d had with their seven year old, wherein the 7YO asked if everyone dies. When the mother confirmed it he said something like “well if everyone does it, why are we so afraid of it?” Very insightful – but I agree, I worry about death. Not to the point of panic attacks, but just enough that I want to plan through that eventuality. Thanks for popping in! As a nurse I am so happy to see articles like this! It is sad to see family argue over or not know a patient’s wishes and continue to ask for difficult treatment just because the patient is nonverbal. I have taken care of older patients who are not brain dead by any means, but are not speaking hardly at all. You can see the pain in their eyes and their facial expressions, but families continue to ask for more treatment. This is wonderful that you are talking about this with your husband, but I encourage you to document this through an advanced directive or living will. These documents can legally declare your wishes even when you are unable to speak for yourself. It may also be easier on your husband as any additional family members will not be able to easily argue against his decisions as they are being made according to your documented wishes. Hopefully the time never comes to where you or he need these documents. But, it is always better to do it just in case. I had a living will drawn up while I was with my ex husband – and updated it prior to surgery to add Hubs as my decision maker. That being said though – you’ve just reminded me that Hubs doesn’t have one…and maybe we should have that discussion. I think his family would respect me as decision maker – but emotions being what they are – it would be nice to have that backed up. It’s a huge decision and so important that your loved ones know your wishes ahead of time. I also definitely think it eases some of the stress on loved ones in those moments when huge decisions must be made and no one is really in a frame of mind to do that – too much emotion. Good sound advice, Liv. I think I’m like you both – I NEED to walk the dog to center me and calm me, but not three times a day. Once a day, and then two times a day to curl up with a book. These are not conversations we have a lot, although they’re coming up more now that I’m almost the age my father was when he suddenly passed away. I’m sure it’s much more real in your eyes. They are important conversations given that light. Wow, this is really deep and definitely sparks a light in me that this is something I should discuss with my spouse. I suppose because we are still young, it’s not something we think about, but that’s not to say something couldn’t happen to one of us tomorrow or even in the next hour. This is something I’d have to think long and hard on. I’m glad I could spark the conversation. On the serious side, though, Hubby and I have our wills done and our beneficiary stuff done, but we’ve never set a firm plan about where are lines are. He knows that I changed my mind about cremation and now favor that over burial, and I did once tell him I’d like for each family member to have a few of my ashes to spread someplace special to them…maybe even using some of the little bit of life insurance to go to some place they’ve always wished they could see. I think with hubs and I its an ongoing conversation. I put a lot of thought into it when I was married to my first husband – and ended up having my mother take power of attorney just in case something happened to me – because I knew he wouldn’t respect my wishes (in hindsight I should rather of pursued divorce papers if I was going to sign a legal document, but I digress). Very important to have those conversations absolutely. My husband and I discuss our wishes quite often. He tells me his funeral order of service, while I tell him the circumstances under which he should take me to Dignitas. I don’t really want a funeral, I just want to be buried quietly and privately. No flowers or service -I feel it would be a terrible waste of time and money. But funerals are more for those who are left behind, so whatever my husband and children want is fine by me. I share your husband’s feelings, in relation to my body failing, well before my mind has left the building. I wouldn’t like to be trapped inside a body that’s slowly shutting up shop. I have claustrophobia, so this may be the reason behind my feelings. But like you say, your husband may change his mind, and so may I. I suppose we just have to cross certain bridges if and when we get to them. As may I. Hopefully none of us has to find out. Powerful message of compassion and love in this post – and the importance of having these conversations while we can and are able. It’s a wonderful thing that you and your husband have been able to have these discussions – I still know far too many people who have not (we’re well past the point where the actuarial tables have swung against us). And it shows how strong your relationship is that you can repeat each other choices – and the possibility that those choices may change as the circumstance warrant. Sometimes the deepest expression of love is knowing when to let go. Truthfully part of the reason we had the conversation was because my ex insisted if I went first he would bury me despite my wishes. And he would never pull the proverbial plug because of what he needed. I’m glad that I now have someone who I can feel comfortable will respect my wishes. Perhaps it’s indicative of how I thought things were going with Exby, but I’ve never made a will. Whilst we were together it was understood that he’d get all my crap. Now I’m back home, if anything happens, it will be my family who have to deal with it (and thank goodness I’ve gotten rid of a lot of it already!). I have maybe two or three paintings of small value, and everything else is really just junk. I never wanted to be cremated – I just don’t like the idea of being burned up. I suspect by the time it comes to it (if I live long enough) it won’t be an option. I also wonder whether by that time, there’ll be an externally imposed ‘line’ for when people come to the end of their usefulness. A lot could change in 40? 50? years. I’m glad you and your husband have had these conversations and reached these arrangements. That’s extremely forward thinking, and perhaps I’ve been remiss in not thinking about that kind of thing. I’m an organ donor. I suppose after that point it doesn’t matter what they do with the rest. I should probably opt for whatever’s cheapest. That’s the thing…you don’t really get to make the choice *after*. As you’re in someone else’s hands. That’s why you need to make it known either through a discussion or a will beforehand. Yeah. I think at the moment I’ve casually said to mum and WonderAunty that all my stuff would go to them. I wonder if I need to start thinking about other people at some point, but in all honesty I don’t know what I have that anyone else would want or need. Most of it can go to charity shops or be thrown out. This is such an important topic, Liv. Great subtopic on compassion! We’ve had this conversation as well but I need to get my will up to date (again). It sounds like you and your hubs really have a clear understanding and compassion for each other’s wishes. Wonderful post!! I just hope neither of us has to test it.